This is the time of year we are beginning t0 receive tax forms from various financial entities. It reminds us that April 15 is coming, to get our records together and file our income taxes. And then pay up! While we may grumble to some extent about taxes, the waste of government and the supposed inequities in the system, taxes are necessary. It is ironic that these two groups would join forces with a common question. The Herodians supported the house of Herod and the Roman rule. The Pharisees regarded Herodians as “evil usurpers of the throne of David.” They resented the Roman occupation of Palestine. And opposed the poll tax. But they had a common enemy. Jesus. They were trying to trap him. Mark says they were trying “to catch him in his words.” But Jesus knew their hearts and was aware of their hypocrisy. “Caesar’s,” they all had to admit. Through the years I have encountered some Christians who object to paying taxes because they disagree with the way our tax dollars are used. They point to the support of programs they find morally objectionable as a defense. Some have even gone so far as saying, we are not responsible to obey and support a corrupt government. Thus, we are told to “render unto Caesar.” That means “to pay a debt, to pay back.” Our tax money provides fire and police protection. Supports our military. Cares for the indigent and underprivileged in our communities. And it pays the salaries of those who administer those programs. Some of whom are Christians. While we may not agree with all elected officials or their policies and programs, we are duty bound as disciples of Christ to pay the taxes we lawfully owe. When we meet our obligations as citizens we are obeying God. The Bible states the governmental authorities that exist are “appointed by God.” When we resist, we are disrespecting God (Rom. 13:1-2). When we try to justify disobedience due to the corruption and immorality of our leaders, imagine being a Christian in New Testament times. Paganism was widely practiced. The Governors were corrupt. Many of the Roman Emperors were homosexuals and even pedophiles. The Roman historian Suetonius wrote the Emperor Tiberius, who was in power during Jesus’ day, retired to the island of Capri to engage in “wanton sexual pleasure” with young boys and girls. 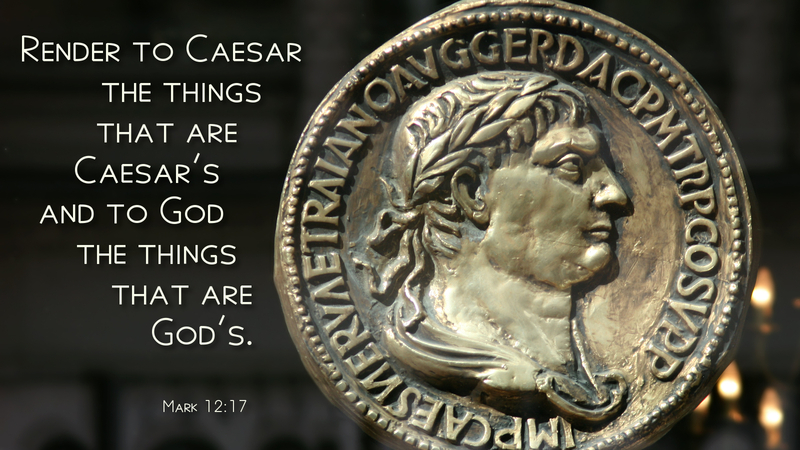 “To render unto Caesar” is to accept that our spiritual commitments involve secular responsibilities. Christians are called to be honest, honorable and ethical. To fail in this regard is to dishonor our King–Jesus Christ. Thanks for the very powerful reminder. We have it very well compared to when Jesus walked among us. May I render today the things that are God’s. Be blessed. God is with you mighty man of God.